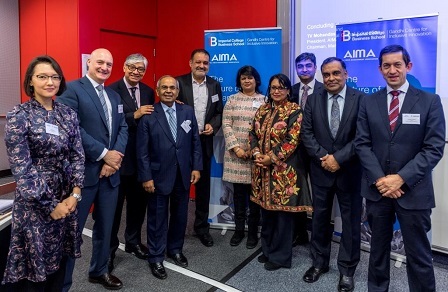 All India Management Association (AIMA) in its endeavour to provide a platform for thought-provoking deliberations, organised the 2nd Imperial College Business School-AIMA Conference on 30th May 2018 in London. Leaders from all walks of life stressed on the need to adapt and discussed the shifting dynamics of global competition and growth. Rt Hon Baroness Sandip Verma, Member, House of Lords, UK, Global Chairperson, Institute of Directors, India, Chairperson, European External Affairs Committee and Former Minister of Energy & Climate Change delivered the keynote address. “The end user is ultimately not to be ignored. It’s the person who will keep an organisation afloat or break your organisation. Recent political landscapes also demonstrate that unless everyone believes they are sharing the success of economic growth, the dissatisfaction will filter through the cracks” she said. The inaugural session was concluded by Mr TV Mohandas Pai, President, AIMA and Chairman, Manipal Global Education Services. Francisco Veloso, Dean, Imperial College Business School delivered the welcome address, followed by a special address by Gopichand P Hinduja, Co-Chairman, Hinduja Group of Companies and Chairman, Hinduja Automotive Limited, UK. Some of the eminent speakers included Mr David Gann CBE, Vice President (Innovation), Imperial College London; Ms Jana Blount, Legal Innovation Manager, DLA Piper; Mr Mark Kennedy, Director, Imperial Business Analytics and Associate Professor, OB & Strategy, Imperial College Business School; Lord Karan Bilimoria CBE DL, Chairman, Cobra Beer Partnership; Mr Pramod Bhasin, Founder, Genpact and Chairman, Clix Capital; Mr Rajive Kaul, Chairman, Nicco Group; Ms Daljit Bamford, Director of Strategic Programs, EMEA, Salesforce; Mr Nelson Phillips, Abu Dhabi Chamber Chair in Strategy and Innovation, Imperial College Business School. Sankalp Chaturvedi, Director, Gandhi Centre for Inclusive Innovation, Imperial College Business School, presented the concluding remarks.